'Tis the season for road trips... JD is in San Diego with all you ISTE types. And having a grand time learning about ePortfolios and making new friends from what I can tell on the Twitter feed. 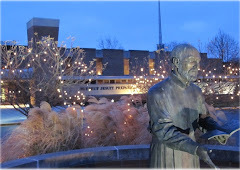 I am off to Milwaukee for the JSEA (that's Jesuit Secondary Education Association) Symposium focusing on professional development. We had a spare 20 minutes on Thursday so we filmed Episode 2 of the Jen and JD Show. I am sure actual blog posts with thoughtful written insight will be coming soon - but probably not this week. In the meantime -Enjoy! PS - This was a day off for me... thus the snazzy shorts and ponytail. I was hauling my 2nd grader to science camp... don't judge. 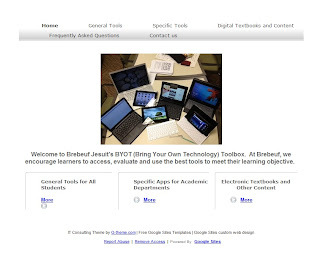 Authentic learning objective: Create a webpage for Brebeuf Jesuit's 1:1 BYOT initiative with tools, FAQ's and contact information. Evaluation: I didn't have much time (or coding talent) so a template based system was appropriate. We are a Google Apps for Education school for it made sense to try out another level of the system. Reflection: I would say that for the entry-level, "I need a website quick" user the tool was perfect. This toolbox was made specifically for the Brebeuf Jesuit Preparatory School community. That said, feel free to borrow any page or content... just give us a little citation love please. Yes, We Have a Show! In much the same way as Mickey Rooney and Judy Garland would say "Let's Put on a Show" and suddenly a fully constructed proscenium arch would appear in Grandpa's barn... we thought we'd venture into video production. Cross Posted from Confessions of a School CIO. Do that interactive PLN thing that you do SO well. Episode 1: The Snarkfest o' Educational Stuff. The Teacher Resource Center before the cameras were arranged. Here's the Screencast/Vlog/Video Link CLICK HERE﻿ to view. The feedback loop is hinting that @jdferries and I are speaking a little too "techie" these days for the local school community. And that feedback is probably correct as we hang out with tech-types and each other so much we speak in what sounds like code (and sometimes is code - but I digress)... 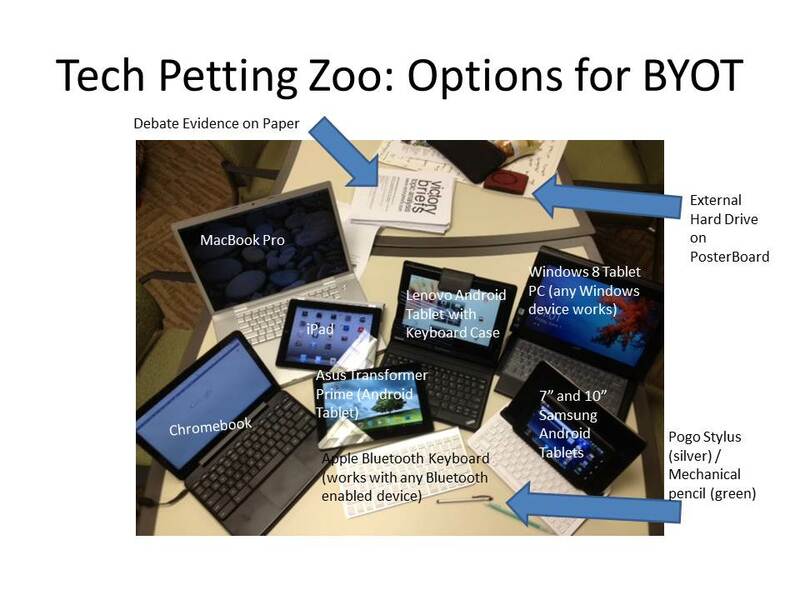 So I am starting this BYOT Glossary for the School Community. All Brebeuf students are expected to have a device, in hand, ready to use on the first day of school for 2012-13! Devices pictured below have been piloted this year (by students - more than one - not just heavy tech users) and we feel confident saying they work at the school. The MBS electronic book platform has also been successfully tested on these devices (the electronic devices - not the mechanical pencil). BYOT: Bring Your Own Device. Refers to a computing model where the student chooses the device best suited for them... rather than an IT department dictating device. For those new to the Bring Your Own Device discussion - I offer some key terminology you'll need to know in the glossary below. Regular readers - feel free to add other suggestions in the Comments box below. Eventually this will all go on the school website - but as the website is being redesigned I thought why not start here on the blog. The following are operating systems… basically what makes the device turn on, light up and run programs you want…These operating systems work on the Brebeuf Jesuit network. Android – refers to operating system for mobile devices not made by Apple. Marketplaces include Google Play, Amazon App Store for Android and Android Marketplace. Chromium – refers to operating system creating by Google. Currently only runs on Chromebook sold by Samsung and Acer. Unlike traditional laptops, Chromebooks are “nothing but web”. At startup, Google Chrome opens and all applications are run through browser based apps. Marketplaces are Chrome Store and Google Play. *** Linux – Open system which is mostly used by tech geeks because it allows for modifications and doesn’t involve all the licensing mess of Mac OS and Windows. We have not tested Linux extensively on Brebeuf network – if you are thinking of using a Linux machine please stop by IT. App – short for “application”. Apps are small, single use programs that run typically on mobile device (although apps for full Apple and Windows devices are in the works). Cloud Storage – back in the day, when you hit File-Save, the document saved on the computer in front of you or a server in the basement of the building you worked in. Now there is a third option generically called “The Cloud”. Don’t be confused, the file still sits on a server in the basement… it’s just that the basement is 600 miles away. You can access that server from anywhere, anytime as long as you have an Internet connection. eReader – Devices specifically designed for reading electronic texts. While some eReaders may do basic web-based activities, the primary function of the device is reading. Think of a book that can get to your email. These do not meet Brebeuf 1:1 BYOT requirements as you cannot create documents, presentations or spreadsheets on these devices. Marketplace/Store/Walled Garden – Each mobile operating system has online store where one buys apps, music and movies. These stores (gardens) do not share between each other (thus the wall) very easily if not at all. For example, an iTunes app for iPhone cannot be transferred to an Android device and vice versa. We mention this because a garden can influence preferred device – particularly if you have money invested in one garden already.